ALBANY PARK — Maria De Leon is just finishing up her freshman year at Von Steuben Metropolitan Science Center, but she can already add "magazine editor" to her resume. De Leon is one of a core group of underclassmen behind last week's launch of Ricochet Review, the high school's new poetry magazine. "No one knew how to do anything," said De Leon, who was still getting lost in the school's halls when she volunteered for the publication, eventually becoming managing editor. "I kind of took in all this work." "If she wants to do something, she needs to do it," Jojit De Leon said of her daughter. The elder De Leon wasn't even aware the teen could write. "When the book came out, it was like wow, she's amazing," the mother said. "They're crazy good," Maja Teref, Von Steuben English teacher and the review's faculty adviser, said of her students. "They're like 47-year-olds — they just look like little munchkins on the outside." The seeds for Ricochet were planted last spring when Teref invited Von Steuben Principal Pedro Alonso to a reading sponsored by Rhino Poetry, an award-winning literary journal based in Evanston. "Alonso was blown away by the atmosphere," she recalled. "He said to me, 'Teref, you think you could do something like this at Von?'" She could, with a little help from her friends. Along with encouraging submissions from her students, Teref and her husband Steven, who teaches writing and literature at Columbia College, called on their connections within the literary community to mentor Von Steuben's "apprentice" poets. "What's interesting about our magazine is we don't just accept everything and publish it," said Teref. "The students are paired with established poets." Steven Teref, who has translated poetry collections with his wife, signed on as the review's editorial advisor, schooling students on the fine art of editing poetry. "He helped me a lot," said sophomore Marti Rosen, who took on the title of poetry editor and also happened to come up with the name Ricochet. The word is one of her favorites, she said, and conveys the notion of "poetry and ideas bouncing all over the place, ricocheting all over." Accustomed to proofreading her classmates' work for grammar and punctuation, Rosen — who said she has had a notebook and pen in hand "ever since I was a little girl" — was nervous about tackling poems. Deleting a word or adding a period can completely alter the work's meaning. "It was actually pretty difficult for me," she said. "[Teref] broke it down for me bit by bit." "When I was in high school, I would have died for the opportunity to talk to a real poet," said Steven Teref, speaking at the launch festivities. "I was happy to share what little I know." De Leon, who has three poems published in the inaugural Ricochet Review, was mentored by Ryan Collins, an English instructor at St. Ambrose University in Iowa. "The first time I emailed him, I was shaking in front of my screen," De Leon said. "I tried to make myself sound professional." Collins' "laid back" response put the teen at ease as she sent him her poems for scrutiny. "He taught me that something unexpected in a poem is very compelling," said De Leon, who's planning a career as a writer. 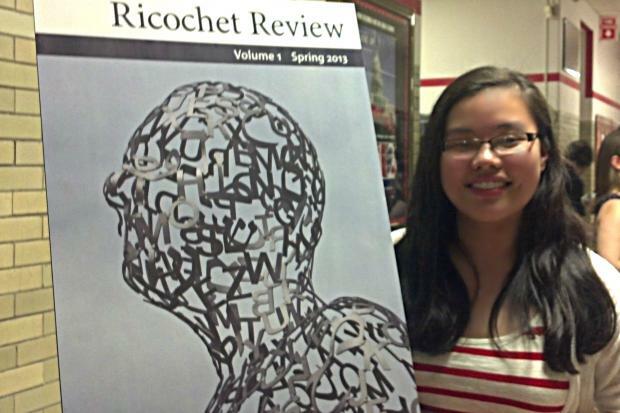 For Principal Alonso, who paid for the printing of 350 copies of the review out of the school's reserve funds, the launch of Ricochet's first edition was satisfying on a number of fronts. "These are now published poets," he said. "They're not just taking classes. They've learned how to express themselves, they're building this community, this fellowship. It's no longer an experiment, it's a reality." More than just giving students real-world experience, creative enterprises such as Ricochet provide an important balance in developing cultured adults, Alonso said. "You come to school to be refined," he said. "It promotes elegance, it promotes some style. If you're educated, you have a way of presenting yourself." Students are already champing at the bit to get to work on the second issue of Ricochet, which will publish annually. Rosen didn't even attempt to conceal her enthusiasm for the project. "The whole idea of having a publishing credit ... it's an amazing experience I would recommend to anyone in the world." Ricochet Review is seeking additional mentors for its apprentice poets. Interested individuals should email managing.editor@ricochetreview.org.